I haven’t used butter in my house in almost over two years. 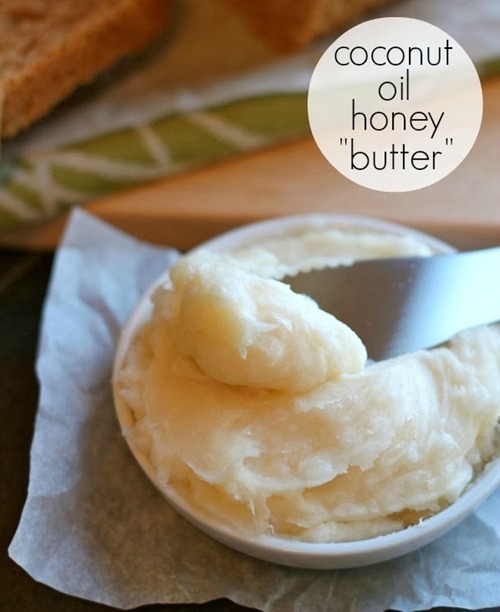 I became introduced to coconut oil as a healthy replacement to butter and have become hooked! Not only is it a healthy alternative but it really enhances the flavors of my food. Instead of my food tasting like butter, the natural flavors of the food are really enhanced by cooking with coconut oil. I must admit that I do miss the taste of butter, especially on my toast in the mornings. 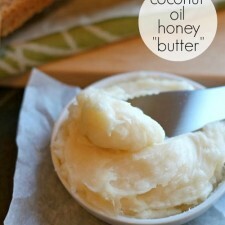 This is where a new favorite recipe of mine comes into play; coconut oil honey butter! Add coconut oil and honey into a medium sized mixing bowl. Mix together, using a hand mixer, until blended together and creamy. This recipe is super simple and tastes better than “original” honey butter, in my opinion! I enjoy spreading this on my three-ingredient biscuits when they are still warm. You can also spread this on your toast, banana bread, rolls and anything else that you can think of. I originally wanted to re-create this recipe because my husband and I went out to dinner and they served a cinnamon honey butter with the rolls that came out before the meal. It was phenomenal and I’m not only saying that because I’m pregnant!! For added flavor, mix some cinnamon into the recipe. What about storing? Any recommendations? Leah – You can store this in your pantry in an airtight container. Coconut oil changes from a liquid to a solid at 76 degrees, so if you store it in the refrigerator be prepared for some hard coconut oil. Enjoy!